For the American computer scientist, see Louis B. Kahn. For the French Jewish admiral, see Louis Kahn (admiral). Louis Isadore Kahn (born Itze-Leib Schmuilowsky) (March 5 [O.S. 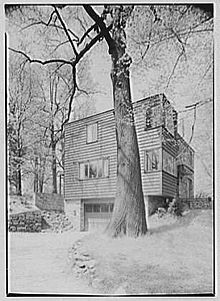 February 20] 1901 – March 17, 1974) was an American architect, based in Philadelphia. After working in various capacities for several firms in Philadelphia, he founded his own atelier in 1935. While continuing his private practice, he served as a design critic and professor of architecture at Yale School of Architecture from 1947 to 1957. From 1957 until his death, he was a professor of architecture at the School of Design at the University of Pennsylvania. Kahn created a style that was monumental and monolithic; his heavy buildings for the most part do not hide their weight, their materials, or the way they are assembled. Famous for his meticulously built works, his provocative proposals that remained unbuilt, and his teaching, Kahn was one of the most influential architects of the twentieth century. He was awarded the AIA Gold Medal and the RIBA Gold Medal. At the time of his death he was considered by some as "America's foremost living architect." Louis Kahn, whose original name was Itze-Leib (Leiser-Itze) Schmuilowsky (Schmalowski), was born into a poor Jewish family in Pärnu, formerly in Russian Empire, but now in Estonia. He spent his early childhood in Kuressaare on the island of Saaremaa, then part of the Russian Empire's Livonian Governorate. At the age of three, he saw coals in the stove and was captivated by the light of the coal. He put the coal in his apron, which caught on fire and burned his face. He carried these scars for the rest of his life. In 1906, his family emigrated to the United States, as they feared that his father would be recalled into the military during the Russo-Japanese War. His birth year may have been inaccurately recorded in the process of immigration. According to his son's 2003 documentary film, the family could not afford pencils. They made their own charcoal sticks from burnt twigs so that Louis could earn a little money from drawings. Later he earned money by playing piano to accompany silent movies in theaters. He became a naturalized citizen on May 15, 1914. His father changed their name to Kahn in 1915. His talent for drawing won Kahn a place at Philadelphia Central High School. Encouraged by his teachers, who recognised his talents, he eventually achieved a full scholarship to the University of Pennsylvania. There, he studied under Paul Philippe Cret in a rigorous Beaux-Arts tradition, with its emphasis on drawing. After completing his Bachelor of Architecture in 1924, Kahn worked as senior draftsman in the office of the city architect, John Molitor. He worked on the designs for the 1926 Sesquicentennial Exposition. In 1928, Kahn made a European tour. He was interested particularly in the medieval walled city of Carcassonne, France, and the castles of Scotland, rather than any of the strongholds of classicism or modernism. After returning to the United States in 1929, Kahn worked in the offices of Paul Philippe Cret, his former studio critic at the University of Pennsylvania, and then with Zantzinger, Borie and Medary in Philadelphia. In 1932, Kahn and Dominique Berninger founded the Architectural Research Group, whose members were interested in the populist social agenda and new aesthetics of the European avant-gardes. Among the projects Kahn worked on during this collaboration are schemes for public housing that he had presented to the Public Works Administration, which supported some similar projects during the Great Depression. They remained unbuilt. Among the more important of Kahn's early collaborations was one with George Howe. Kahn worked with Howe in the late 1930s on projects for the Philadelphia Housing Authority and again in 1940, along with German-born architect Oscar Stonorov, for the design of housing developments in other parts of Pennsylvania. A formal architectural office partnership between Kahn and Oscar Stonorov began in February 1942 and ended in March 1947, which produced fifty-four documented projects and buildings. Kahn did not arrive at his distinctive architectural style until he was in his fifties. Initially working in a fairly orthodox version of the International Style, he was influenced vitally by a stay as Architect in Residence at the American Academy in Rome during 1950, which marked a turning point in his career. After visiting the ruins of ancient buildings in Italy, Greece, and Egypt, he adopted a back-to-the-basics approach. He developed his own style as influenced by earlier modern movements, but not limited by their sometimes-dogmatic ideologies. In 1961 he received a grant from the Graham Foundation for Advanced Studies in the Fine Arts to study traffic movement in Philadelphia and to create a proposal for a viaduct system. In the center of town the streets should become buildings. This should be interplayed with a sense of movement which does not tax local streets for non-local traffic. There should be a system of viaducts which encase an area which can reclaim the local streets for their own use, and it should be made so this viaduct has a ground floor of shops and usable area. A model which I did for the Graham Foundation recently, and which I presented to Mr. Entenza, showed the scheme. Kahn's teaching career began at Yale University in 1947. He eventually was named as the Albert F. Bemis Professor of Architecture and Planning at Massachusetts Institute of Technology in 1956. Kahn then returned to Philadelphia to teach at the University of Pennsylvania from 1957 until his death, becoming the Paul Philippe Cret Professor of Architecture. He also was a visiting lecturer at Princeton University School of Architecture from 1961 to 1967. Kahn was elected a Fellow in the American Institute of Architects (AIA) in 1953. He was made a member of the National Institute of Arts and Letters in 1964. He was awarded the Frank P. Brown Medal in 1964. In 1965 he was elected into the National Academy of Design as an Associate Academician. He was made a member of the American Academy of Arts and Sciences in 1968 and awarded the AIA Gold Medal, the highest award given by the AIA, in 1971, and the Royal Gold Medal by the RIBA, in 1972. In 1974, Kahn died of a heart attack in a restroom at Penn Station in Manhattan. He had just returned from a work trip to India. Owing to police miscommunications in both New York City and Philadelphia, his wife and his office were not notified until two days after his death. After his long career, he was in debt when he died. Kahn had three children with three women. With his wife, Esther (1905-1996), whom he married in 1930, he had a daughter, Sue Ann. With Anne Tyng, who began her working collaboration and personal relationship with Kahn in 1945, he also had a daughter, Alexandra. When Tyng became pregnant in 1953, to mitigate the scandal, she went to Rome, Italy, for the birth of their daughter. With Harriet Pattison, he had a son, Nathaniel Kahn. Most biographical works on Kahn fail to describe the profound impact his female partners had on his designs. Anne Tyng was an extremely talented architect and teacher, while Harriet Pattison was a pioneering landscape architect. Kahn's obituary in the New York Times written by Paul Goldberger mentions only Esther and his daughter by her as survivors. All of his children and their mothers attended the funeral. In 2003 Nathaniel Kahn released a documentary about his father, entitled, My Architect: A Son's Journey. The Oscar-nominated film provides views and insights into the architecture of Kahn while exploring him personally through people who knew him: family, friends, and colleagues. It includes interviews with such renowned architectural contemporaries as Muzharul Islam, B. V. Doshi, Frank Gehry, Ed Bacon, Philip Johnson, I. M. Pei, Vincent J. Scully, and Robert A. M. Stern. It also provides insights into Kahn's unusual and complicated family arrangements. Yale University Art Gallery, New Haven, Connecticut (1951–1953), the first significant commission of Louis Kahn and his first masterpiece, replete with technical innovations. For example, he designed a hollow concrete tetrahedral space-frame that did away with the need for ductwork and reduced the floor-to-floor height by channeling air through the structure itself. Like many of Kahn's buildings, the Art Gallery makes subtle references to its context while overtly rejecting any historical style. Richards Medical Research Laboratories, University of Pennsylvania, Philadelphia, Pennsylvania (1957–1965), a breakthrough in Kahn's career that helped set new directions for modern architecture with its clear expression of served and servant spaces and its evocation of the architecture of the past. 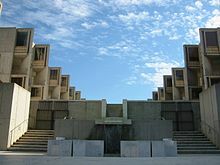 The Salk Institute, La Jolla, California (1959–1965) was to be a campus composed of three main clusters: meeting and conference areas, living quarters, and laboratories. Only the laboratory cluster, consisting of two parallel blocks enclosing a water garden, was built. The two laboratory blocks frame a long view of the Pacific Ocean, accentuated by a thin linear fountain that seems to reach for the horizon. It has been named "arguably the defining work" of Kahn. First Unitarian Church, Rochester, New York (1959–1969), named as one of the greatest religious structures of the twentieth century by Paul Goldberger, the Pulitzer Prize-winning architectural critic. Tall, narrow window recesses create an irregular rhythm of shadows on the exterior while four light towers flood the sanctuary walls with indirect, natural light. Eleanor Donnelly Erdman Hall, Bryn Mawr College, Bryn Mawr, Pennsylvania (1960-1965), designed as a modern Scottish castle. Page text. Phillips Exeter Academy Library, Exeter, New Hampshire (1965–1972), awarded the Twenty-five Year Award by the American Institute of Architects in 1997. It is famous for its dramatic atrium with enormous circular openings into the book stacks. Kimbell Art Museum, Fort Worth, Texas (1967–1972), features repeated bays of cycloid-shaped barrel vaults with light slits along the apex, which bathe the artwork on display in an ever-changing diffuse light. Jatiyo Sangshad Bhaban (National Assembly Building) in Dhaka, Bangladesh was Kahn's last project, developed 1962 to 1974. Kahn got the design contract with the help of Muzharul Islam, one of his students at Yale University, who worked with him on the project. The Bangladeshi Parliament building is the centerpiece of the national capital complex designed by Kahn, which includes hostels, dining halls, and a hospital. According to Robert McCarter, author of Louis I. Kahn, "it is one of the twentieth century's greatest architectural monuments, and is without question Kahn's magnum opus." 1974 – Franklin D. Roosevelt Four Freedoms Park, Roosevelt Island, New York City, New York, completed 2012. If you think of Brick, you say to Brick, 'What do you want, Brick?' And Brick says to you, 'I like an Arch.' And if you say to Brick, 'Look, arches are expensive, and I can use a concrete lintel over you. What do you think of that, Brick?' Brick says, 'I like an Arch.' And it's important, you see, that you honor the material that you use. ... You can only do it if you honor the brick and glorify the brick instead of shortchanging it. While widely known for the poetic sensibilities of his spaces, Kahn also worked closely with engineers and contractors on his buildings. The results often were technically innovative and highly refined. In addition to the influence Kahn's more well-known work has on contemporary architects (such as Muzharul Islam, Tadao Ando), some of his work (especially the unbuilt City Tower Project) became very influential among the high-tech architects of the late twentieth century (such as Renzo Piano, who worked in Kahn's office, Richard Rogers, and Norman Foster). His prominent apprentices include Muzharul Islam, Moshe Safdie, Robert Venturi, Jack Diamond, and Charles Dagit. There's a magic to the project. That the task is daunting makes it worthy of the man it honors, who guided the nation through the Depression, the New Deal and a world war. As for Mr. Kahn, he died in 1974, as he passed alone through New York City's Penn Station. In his briefcase were renderings of the memorial, his last completed plan. ... simple and elegant. Drawing inspiration from Roosevelt's defense of the Four Freedoms—of speech and religion, and from want and fear—he designed an open 'room and a garden' at the bottom of the island. Trees on either side form a 'V' defining a green space, and leading to a two-walled stone room at the water's edge that frames the United Nations and the rest of the skyline. A group spearheaded by William J. vanden Heuvel raised over $50 million in public and private funds between 2005 and 2012 to establish the memorial. Franklin D. Roosevelt Four Freedoms Park officially opened to the public on October 24, 2012. Pulitzer Prize-winning composer Lewis Spratlan, with collaborators Jenny Kallick and John Downey (Amherst College class of 2003), composed the chamber opera Architect as a character study of Kahn. The premiere recording was due to be released in 2012 by Navona Records. Kahn was the subject of the Oscar-nominated documentary film My Architect: A Son's Journey, presented by Nathaniel Kahn, his son. :127 Kahn's complicated family life inspired the "Undaunted Mettle" episode of Law & Order: Criminal Intent. In the film Indecent Proposal, character David Murphy (played by Woody Harrelson), referenced Kahn during a lecture to architecture students, attributing the quote "Even a brick wants to be something" to Kahn. ^ a b Karin Paulus, Olavi Pesti (2006). "Kus sündis Louis Kahn?" [Where was Louis Kahn born?] (in Estonian). Eesti Ekspress. ^ a b Goldberger, Paul (March 20, 1974). "Louis I. Kahn Dies; Architect was 73". New York Times. Retrieved May 2, 2018. ^ Commstock, Paul. "An Interview with Louis Kahn Biographer Carter Wiseman," California Literary Review. June 15, 2007. ^ Johnson, Eugene J. "A Drawing of the Cathedral of Albi by Louis I. Kahn," Gesta, Vol. 25, No. 1, pp. 159–165. ^ "The Pacific Coast Architecture Database". The Pacific Coast Architecture Database. Retrieved 2 May 2014. ^ "List of Buildings and Projects by Stonorov & Kahn Associated Architects". Philadelphia Architects and Buildings. Philadelphia Architects and Buildings. Retrieved 2 May 2014. ^ a b Kahn, Louis I.; Robert C. Twombly (2003). Louis Kahn: Essential Texts. W. W. Norton & Company. ISBN 0-393-73113-8. ^ Saffron, Inga (January 7, 2012). "Anne Tyng, 91, groundbreaking architect". Philly.com. Retrieved 2012-01-08. ^ Goldberger, Paul (Dec 26, 1982). "Housing for the Spirit". New York Times. ^ "Archived copy". Archived from the original on 2017-10-23. Retrieved 2017-10-23. CS1 maint: Archived copy as title (link). ^ McCarter, Robert (2005). Louis I. Kahn. London: Phaidon Press. p. 258,270. ISBN 0-7148-4045-9. ^ Margaret Esherick House from Flickr. ^ Foderaro, Lisa W. (October 17, 2012). "Dedicating Park to Roosevelt and His View of Freedom". New York Times. Retrieved November 14, 2012. The work was commission in 1972, and Kahn was carrying his designs for the project when he died. ^ "A Roosevelt for Roosevelt Island," New York Times. November 5, 2007. ^ a b Natasha Case; Freya Estreller; Kathleen Squires (2014-05-20). Coolhaus Ice Cream Book: Custom-Built Sandwiches with Crazy-Good Combos of Cookies, Ice Creams, Gelatos, and Sorbets. Houghton Mifflin Harcourt. ISBN 978-0-544-12978-8. Retrieved 2014-10-29. ^ "Coolhaus menu". Coolhaus official site. n.d. Archived from the original on 2014-10-30. Retrieved 2014-10-29. Curtis, William (1987). Modern Architecture Since 1900 (2nd ed.). Prentice-Hall. pp. 309–316. ISBN 0-13-586694-4. Ronner, Heinz; Jhaveri, Sharad; Vasella, Alessandro (1977). Louis I.Kahn: Complete Works 1935–1974 (first ed.). Boulder: Westview Press. ISBN 0-89158-648-2. Leslie, Thomas. (2005). Louis I.Kahn: Building Art, Building Science. New York: George Braziller. ISBN 0-8076-1540-4. McCarter, Robert (2004). Louis I. Kahn. Phaidon Press Ltd. p. 512. ISBN 0-7148-4045-9. Larson, Kent (2000). Louis I. Kahn: Unbuilt Masterworks. New York: Monacelli Press. p. 232. ISBN 1-58093-014-X. Rosa, Joseph (2006). Peter Gossel (ed.). Louis I.Kahn: Enlightened space. Germany: Taschen GmbH. p. 96. ISBN 3-8228-3641-9. Merrill, Michael (2010). Louis Kahn: Drawing to Find Out. Baden: Lars Mueller Publishers. p. 240. ISBN 978-3-03778-221-7. Merrill, Michael (2010). Louis Kahn: On the Thoughtful Making of Spaces. Baden: Lars Mueller Publishers. p. 240. ISBN 978-3-03778-220-0. Vassella, Alessandro (2013). Louis Kahn: Silence and Light. Zurich: Park Books. pp. 168, 1 Audio-CD. ISBN 978-3-906027-18-0. Solomon, Susan (August 31, 2009). Louis I. Kahn's Jewish Architectur, Brandeis Series in American Jewish History, Culture, and Life. Brandeis. ISBN 978-1584657880. 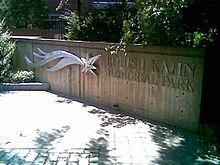 Wikimedia Commons has media related to Louis Kahn.